The plan is to create sculpture park 3 with artist friends. 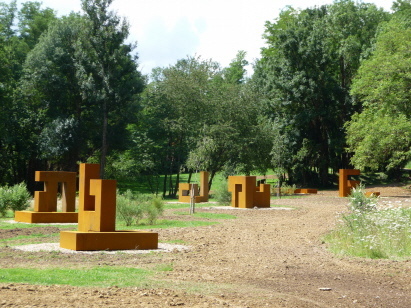 Works by artist friends who were involved in ILE ART are intended to supplement sculpture park 1 and enrich it with their diversity. In the longer term, the intention is to place sculptures and installations along the forest path and the edge of the main park in particularly mystical places. 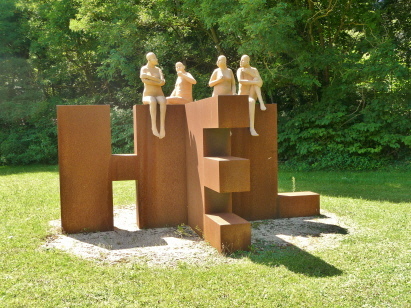 The first work was installed in winter, the four figures by Christina Wendt, who sit on the HELP sculpture and consult with each other and are involved in a discussion. With the symbolism that they are in fact sitting on the HELP sculpture, and are close to the wishing well; a very vivid situation. 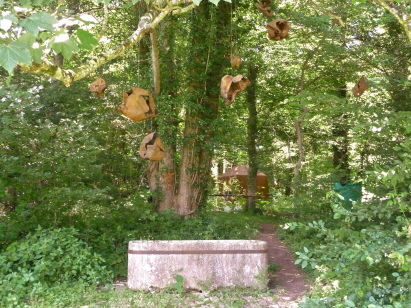 The second addition are the Cocoons hanging on the tree above the wishing well, a sound installation by Denis Perez. People wanting to bring their wishes to the wishing well are welcomed with meditative, subtle sounds and with a self-image in the mirror of the well's surface. 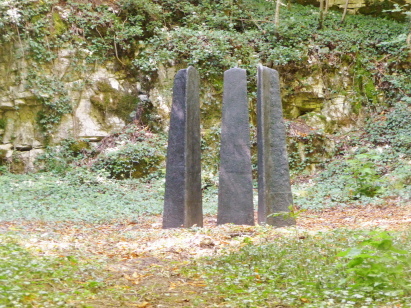 Further up in the forest, in one of the most mystical places in the park, are the three wise ones (they are women: Margareta, Catarina and Barbara) by Joseph Ginet. They emanate a very deep calm, spreading an extraordinarily strong meditative mood in a very mysterious place. Photos of the installations and sculptures are in the section on Park 3. Most of the massive steel sculptures from Park 2 were moved to Park 1, so that Park 2 was freed up for the new design with monumental sculptures. Sculpture park 2 between the main park and the Ognon river was completely redesigned between March and July. By clearing the shrubs on the banks of the Ognon, a view of the river was opened up. 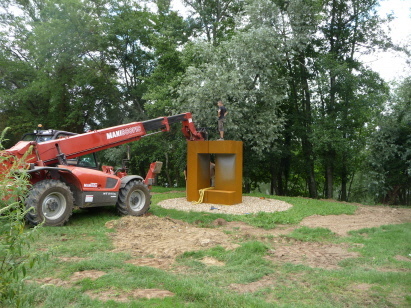 The sculpture areas were then prepared, and at the end of July, 13 monumental sculptures by Andrea Malär (with a total of 44 sculpture pieces) were installed there. The themes of the sculptures are the symbolism of the square, polarity, complementarity, framing, soaring, holding together, variability and flexibility, positive energy, harmony and calm. Photographs of the sculptures are enclosed with the section on Park 2, and of the logistics works under Art-Logistics.